Lucy Stone is thrilled to be cast as an extra in a festive period film�until the set becomes a murder scene decorated in blood and buttercream icing. Returning to her role as sleuth, Lucy dashes to restore peace to Tinker�s Cove, unwrap a cold-hearted criminal�s MO, and reveal how one ornate Yule log cake could possibly cause so much drama. Hayley Powell�s holidays aren�t off to a very merry start. 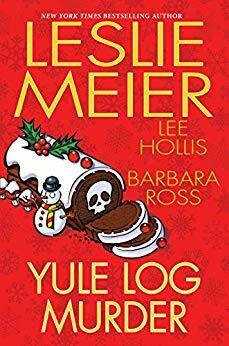 Not only has her daughter brought Conner�an infuriatingly perfect new beau�home to Bar Harbor, but a local troublemaker has been found dead with traces of her signature Yule log cake on his body. As Conner becomes the prime murder suspect, Hayley must put aside her mixed feelings to identify the real killjoy. Realizing she can�t make a decent B�che de No�l to save her life, Julia Snowden enlists the help of her eccentric neighbor, Mrs. St. Onge, in hopes of mastering the dessert for Christmas. With everyone in the old woman�s circle missing or deceased, however, it�s up to Julia to stop the deadly tidings before she�s the next Busman�s Harbor resident to meet a not-so-jolly fate.